I know some just think it’s a rat hole, but for years Chuck E. Cheese was my saving grace to save my sanity. The boys may have been having a day where every word came out a wailing cry of whine, but the moment we stepped foot into the Cheese, all tears were dried, all woes forgotten, all snot just a smear on a sleeve. They would take their golden coins and scamper away; walking up the skeeball machine to plop their balls in as high as they could reach, going from game to game swiping off any leftover tickets, getting stuck in the habit trail, forcing me to push another child up there on a search and rescue mission, before ultimately having to squash up there myself to save them both. We’d be the first ones there, lay claim to a booth in the back and get deep-dish pizza to share even if it was only 10am. By the time the crowds piled in, just before noon, my kiddies and I had already retrieved our prizes and grabbed either a dollar ice cream from the machine or a bag of cotton candy to go. It was all sugary smiles, crappy toys, and children falling asleep in the car on the way home. With all the kids now in full time school and the strict never on weekends rule – I may be crazy but I’m not that crazy – we hadn’t been there in close to a year. So when we had a random day off last week, I decided to surprise them with an impromptu visit. By the time we hit the parking lot there were cheers of ‘Best mom eva!” and I parked the car trying to see past my own giant head. We walked in and stopped cold, our mouths hanging open in ‘Waaaaaa’. This was no Velvetta, this cheese had gone organic. The place had been renovated completely. It was shiny and new. The hamster tunnels were no more. There was open space and new games sparkling through the sun drenched windows. My boys had a beat where they almost couldn’t move, then with frenzied joy tripped over themselves in excitement. I handed them each 50 tokens and didn’t see them again for two hours. Okay, not true. It took them less than an hour to burn through those tokens, but it was a damn good hour. We had the run of the place, with only two other families to share the space with us. One was a mother and a four year old bouncing around from game to game. The other was a mother pushing a baby carriage and dragging a screaming three year old. She was so stressed and miserable, even more so than her boy in the midst of a meltdown. I felt bad for her. I really did. I understood perfectly the stress of an overwhelmed mom. I mean it wasn’t that long ago that I was somewhat in her shoes, but she was barking at him, “You brat! Stop it this instant!” over and over, like yelling at him was going to make him stop crying, instead of making him cry more, which is exactly what he did. I tried not to focus on them, and instead on my happy day with my boys; although every now and then I’d sneak a glance. It was hard not to, the kid was losing it and the mother was having a nervous breakdown among a thousand happy blinking lights and bleeping games. It was almost a cinematic masterpiece. I wanted to tell her to calm down. To let him have his tantrum. That it would be okay. That she would be okay. And losing it and lashing out at a three year old wasn’t going to make him or her feel any better. But I didn’t know any of those things really, so all I did was smile encouragingly, and make a light handed comment about kids being counted on to crack just when you needed them to stay glued together. She didn’t respond. I saw the furrow of her brow, the tight hunch of her shoulders, stress dripping off of her and knew she was in a really ugly moment. I caught a glimpse of them leaving; her pushing the carriage with one hand, dragging her wailing son with the other as my son pulled me away to a machine which was spitting out a million tickets; his face lit brighter than the game. “Mommy! I won!” I smiled indulgently; so much happy for so little invested. We stayed for another half hour, going through 20 more tokens each. before we redeemed our tickets, got some sweets and skipped out the door. It had been a perfect morning. As we drove away, my boys busy breaking the trinkets they won, sticky sweets on their hands and faces, talking loudly over one another with residual excitement; I looked back at them lovingly through the rear view mirror. At 6, 8 and 11, they are growing up so fast. Soon they’ll probably only hang out with me kicking and screaming, or at least muttering and eye-rolling. But I’ll take it. I’ll take every day I’ve got with them. The good, the bad, the ugly. I’m going to appreciate it all. Cheesy as it may sound. Never follow men with candy, but always follow mice with tickets. Posted in Crap that makes me eat too much ice cream and tagged Chuck E. Cheese, family fun, surviving motherhood. Bookmark the permalink. You have to love those ‘best mom eva!’ moments (however few and far between they may be – or is it just me that’s a bit rubbish?). At 3, 7 and 8, my boys and I are following in your footsteps, albeit on a different continent that is lacking in large mice with tickets! This made my heart melt. I loved this piece so much. Can you believe I’ve never been there? This spring break I’ll pop my Cheese cherry. hmmm over the break…? i don’t know about that… if you brave it, go first thing in the morning. don’t say i didn’t warn you.. I love this piece and can relate to the feelings but i’m sorry, I’m one of those, please, oh please, anywhere but there, moms. But it sounds like you guys had a great time. 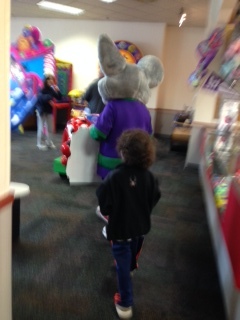 My kids loved Chuck E Cheese. Baby C is only three, but I’m sure he’ll love it, too. oh.. the Cheese stands alone. hee hee. Sounds like a great time! I am cherishing fun mom+2 kids outings before my oldest goes to 4k in September. It will be an adjustment to only have my son around. Does the school year feel really long to you? I have friends who have school age children, and they say time FLIES when they’re in school! hahaha… stay home read books…. hahahaha. i wish. no, i’m kidding. my oldest loves to read and loves ice cream and will even occasionally run with me. the others.. feh… it’s chuck e cheese or bust. good thing i’ve got the place down pat. My kids are teen-agers now, but I loved the trip down memory lane… and time does fly by so enjoy! You are the best mom eva! I managed to raise my daughter without ever once stepping inside a Chuck E. Cheese. ha! thank you. i swear there’s a lot to be said for Chuck. thank you. we have to remember to appreciate. even those crazy times when it all seems to much, we have to breath, step back and know that the moment may be bad but there’s so much good. Oh man, Chuck E. Cheese was a big deal for us as kids. A HUGE deal. My parents didn’t take us often (they viewed it as parental torture), but when they did it was like kid paradise. Reading this brought those memories all back. You’re a good mama. Parenting isn’t for wimps, and I have a feeling that mama you saw will come to learn that in time. i think so. there are bad moments but public bad moments are really bad. i like to think they work up from a good nap, with cheesy, bashful smiles on their faces. I haven’t had to go to see Chuck for a while, but truthfully he never bothered me much. we used to leave before he’d make an appearance. when they were young he’d freak my kids out a bit. Can you believe…. I still have never set foot in a Chuck E Cheeze OR a Cheeburger Cheeburger?! love them both! maybe you have a bias against the franchised letter C establishments. The writing does a wonderful job showing how your family is growing/changing, especially with contrast of the other mother. I liked the paragraph of mom vs happy lights, too. The first year I worked I co-taught a 1st/2nd split. We had 12 kids in our class and we too them to Chuck E Cheese for a year end party. I had never been before and I will never go again. The kids were actually pretty good, and it wasn’t super packed, but I remember feeling very overwhelmed by the noise of the games. well i can’t speak for all cheeses but by me all the habittrails have been removed and it’s really spacious and clean feeling. i’m a fan, but we’re almost aged out. rats. I love Chuck E. Cheese and totally agree it’s a great way to entertain the kids and make them stop whining/complaining their bored… etc. love this post and greatly written! THUMBS UP! 🙂 I’ve been that mom with the kid in the stroller and the other crying and one wanting to be picked up at the same time – and what do I do ? GET IN THE CAR..WE’RE GOING TO CHUCK E. CHEESE…LOL… the remodeling thing I love as well.. the ones here in Chicago were also made over. I honestly didn’t like all those tunnels. I could never really see the kids in them and had to keep getting up to make sure they were okay if I saw them passing by one of the few windows they had in them… with the new look, I can see them easier and more freely and it’s great! :) and the best part is even my 13 year old still loves it. thank you! and think we’ve all had ‘moments’ we’re not proud of. if you’re in chuck e cheese, generally no one will notice you with all bleeping noise. ha. so much better without the tunnels. hated those! with them being a bit older, it’s even better. i don’t have to worry about them and can sit and watch them running gleefully. perfect! Totally agree! 🙂 Great post. This story really makes me sympathize with that woman in her ugly moment. I was quite a bit better at keeping it together than her, but places like Chuck E Cheese don’t bring out my best. i know. it was bad. you have to wonder how bad it was in her head to lose it in public that way. but i like to hope it was just a bad morning at the cheese. I have never gone to the CHuckster as my kiddo used to call it… we did have something similar though a pizza and arcade hybrid of sorts… cant recall the name… the boy is in his 20s now… enjoy the moments they do pass quickly!